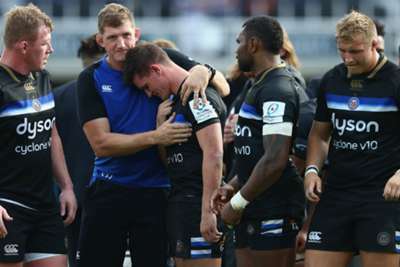 European Professional Club Rugby (EPCR) has confirmed the result of Toulouse's Champions Cup victory at Bath will stand despite the Premiership club complaining the full-time whistle was blown prematurely. Bath went down 22-20 in the Pool 1 fixture in a match that saw Freddie Burns miss a straight-forward penalty before later comically dropping the ball when celebrating a try before he had touched down. However, Bruce Craig - owner of the Premiership club - later called for the match to be replayed on two counts. The first was that television pictures showed three seconds were still on the clock when Bath kicked for a line-out, while Toulouse had Jerome Kaino and Lucas Pointud cited in the fixture – incidents Craig felt would have resulted in red cards if they had been dealt with on the field of play. Speaking to The Times, Craig said: "I think the game should be replayed. We will do what we can to get equity." But the EPCR has confirmed there will be no replay, explaining that while television pictures showed time remaining, referee Andrew Brace followed the official stadium clock and had it confirmed through an earpiece when time had elapsed. "EPCR would like to clarify several issues arising from the Heineken Champions Cup, Round 1 fixture between Bath Rugby and Toulouse at The Recreation Ground on Saturday, October 13," an EPCR statement read. "It has been reported in the media that the match referee, Andrew Brace, blew the full-time whistle three seconds before the 80 minutes had elapsed, however, this is incorrect. "Although the television match graphics indicated that 79 minutes and 57 seconds had elapsed when the match ended, the official stadium clock which was visible to players, club management and to spectators, clearly displayed that 80 minutes had elapsed. "Once Andrew Brace received confirmation in his earpiece from the official timekeeper that time was up, he blew the final whistle. "EPCR accepts that the disparity in this instance between the official time and the time shown on the television match graphics caused some confusion, and ways to avoid any similar situation in the future will be carefully considered by the tournament organiser.